Fall is the best time to prepare your garage for the winter. On the plus side, the weather is a bit cooler and more conducive to working outside. Furthermore, you can gather the whole family and complete the tasks together. Here are a few fall garage maintenance tips that will ensure your garage is in the best shape to weather through the winter. Plus, when you winterize your garage, it saves on energy costs. The first step should be to organize everything in your garage. This area of the house tends to become a dumping ground for all items that you do not know what to do with. Over time, old kids toys, broken household items, holiday decorations get piled everywhere resulting in a cluttered mess. This is where you can enlist the whole family. Pull everything out of the garage and make piles. Things to keep, things to donate, and things to throw away. Organize your storage and relabel everything clearly. If you all are ambitious, have a garage or a yard sale and sell items item you no longer need. Don’t feel like trecking to your local donation center? Schedule a pickup. Lastly, make sure any winter gear is easily accessible and in good working order. You don’t want to wait until a blizzard to locate shovels or to check that the snowblower is working. Before you replace everything back into the garage, consider giving the area a good scrubbing. Sweep and hose down the floor, treating any stains. Dust away cobwebs and was the windows. Clean the garage door inside and out. Once you have straightened everything up, examine the garage for any problems such as mold, bugs, or evidence of critters. Clean out your gutters and downspouts to avoid any leaks in your home or garage. In the winter, think of an uninsulated garage as a huge deep freezer continually blowing cold air at your home. The consider how much harder your HVAC system needs to work to keep your house warm. SO, add insulation or replace the old insulation. Examine corners for any holes and around windows and entry doors for gaps. Fill any spaces with foam insulation. Cover your windows with a weatherproofing film. 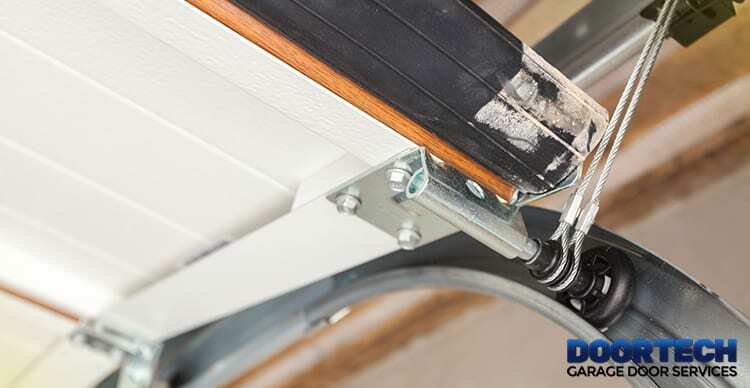 Check the weather stripping on your garage and entry doors. Protect exposed pipes from freezing with insulation. These little steps could make a huge difference in your winter heating bills. Lastly, after everything is organized, clean, and weatherproofed, give your garage door the necessary attention. Check the tracks to make sure they are level and inspect for any dents or bent rails. Examine the rollers. Lubricate all moving parts using a silicone based lubricant. Make sure your torsion springs are in good shape. Finally, tune up your garage door opener. Call in a professional for a free evaluation. Contact Door Tech today. Our technicians will perform a thorough examination and take care of any issues. That way, you will be prepared for whatever winter has in store. Don’t wait until its too late to perform all your fall garage maintenance, schedule an appointment.